David G. Waltrip, was born in Jacksonville, Illinois. 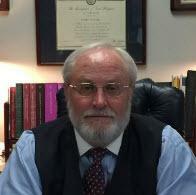 David has been admitted to the Illinois Bar since 1984 and the Missouri Bar since 1985. He has also been admitted to practice in the federal courts before the United States District Courts for the Eastern District Missouri, (1985); the Southern District of Illinois, (2002); the Central District of Illinois (2015); the Eighth Circuit Court of Appeals, (1985); the Ninth Circuit Court of Appeals, (2003); and the United States Court of Military Appeals, (1988). David received a Bachelor of Science degree from MacMurray college in 1976. While attending college, David served as the legislative aide to Illinois State Representative Thomas C. Rose and upon completion of his college education was commissioned as a Second Lieutenant In the United States Marine Corps. Following active duty with the United States Marine Corps from 1976 to 1981, David received his Juris Doctor degree from Southern Illinois University in 1984. Upon graduation from Law School, David served as an assistant State's Attorney for Jackson County, Illinois. During that time, David tried over 150 bench and jury trials ranging from misdemeanor to Attempted Murder cases. In 1985, David joined other fellow Marine Corps officers in the practice of law in St. Louis, Missouri. Since 1985, David has been a member of law firms in St. Louis and primarily focuses his practice in civil matters. David has handled civil, criminal, and military matters as lead counsel in both federal and state courts throughout the United States and has represented a myriad of clients in various states. From 1976 through August, 1981, David served on active duty with the United States Marine Corps. David resigned his regular commission in the Marine Corps and took a Reserve Commission where he completed his duty with the United States Marine Corps Reserve as a Major in 1999. David received the Navy Commendation Medal and other medals, decorations and citations resulting from his active duty and reserve duty with the Marine Corps. David is a member of the Missouri Bar, the Illinois Bar, the St. Louis County Bar Association, and the Bar Association of Metropolitan St. Louis. David served on the Executive Committee of the St. Louis County Bar and was the President of that organization in 1995. David was selected as the Outstanding Young Lawyer of St. Louis County in 1990. David continues to be active with the St. Louis County Bar. Since 1986, David has taught Business Law at Washington University, (University College). David has served as a member of the Board of Directors for the USO of Missouri since 2009 and has served as the President of the Board from 2013 through 2014 and as Chairman of the Board from 2015 through 2016. David practices in various areas of law which include: Civil Litigation in both State and Federal Court; Appellate Law; Business Law; Business Formations; Sale of Business; Business Torts; Commercial Litigation; Business Litigation; Employment contracts; Non-Compete Contracts; Bankruptcy; Business Planning; Contract Development and Review; Mold Remediation Litigation; Mortgage Litigation; Real Estate; Real Estate Contracts for Residential and Commercial Property; Personal Injury including Automobile Accidents; Trucking Accidents; Construction Accidents; Premises Liability; Accidents resulting form negligence of others; Slip and Fall; Wrongful Death; Medical Malpractice; Accounting Malpractice; Domestic Relations Law including Divorce; Dissolution of Marriage; Family Law; Adoptions; Child Support; Child Custody; Visitation Rights; Modification of Judgments and Decrees; Parental Relocation; Complex Division of Marital Property; Antenuptial Agreements; Annulments; Military Divorce; Military Law.